The 55th annual DeKalb County School District Gymnastics Championships was another close contest with the Lakeside Lady Vikings winning their 22nd title via a 104.450-95.850 win over defending champions Druid Hills Lady Red Devils. Coach Elizabeth Krieger’s squad picked up 10 Top five finishes in the meet in winning the coach’s fourth title in six seasons and reversing a 6.1 point loss in 208 that prevented a three-pet for the Lady Vikings. Sophomore Emma Cohen led the way for Lakeside by finishing second in the All-Around with a 36.60 total including a stellar 9.900 score in the floor exercise to collect the gold medal in the event. Cohen took silver in the balance beam (9.400) and tied for silver in the uneven parallel bars (9.200) with teammate senior Amelia Stockwell, the 2017 gold medal winner in the event. She tied for fourth in the vault (8.100) with Arabia Mountain sophomore Ashlynn Carthan. Stockwell, the 2017 All-Around champion, finished fourth (34.50) this year with the tie for silver in the balance beam and a bronze in the floor exercise (9.050). 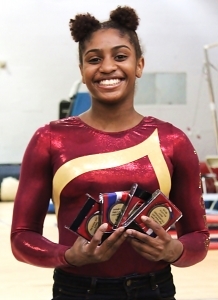 Tucker’s Altagracia Frazier won the 2019 DCSD Gymnastics Championships All Around title. Druid Hills was again led by 2018 All-Around champion senior Amelia Wainscott with a bronze in the balance beam (9.100) and a silver in the floor exercise (9.300). Wainscott finished third in the All-Around with 35.40 points despite improving all her scores from a year ago. Dunwoody finished third in the team standings with 91.700 led by a silver medal in the vault by sophomore Hannah Brett (8.400). The All-Around title was claimed by Tucker sophomore Altagracia Frazier who won three of the four events to total a 36.95 score to nip Cohen by 0.35 points. Frazier won the vault (9.000), uneven parallel bars (9.400) and the balance beam with an excellent score of 9.700. This was the fifth consecutive year to have a different All-Around title winner at the Championships. The last time there was a repeat champion was Lakeside’s Meg Stephens who won three consecutive titles from 2012 to 2014. Lakeside’s title was its sixth in eight seasons dating back to 2012 and 22nd overall since the meet began in 1966. Tucker is a distant second to Lakeside with 9 county championships followed by Redan with 8 and Dunwoody with 7.